← What is causing Modi wave? Today, BJP released its Election 2014 manifesto. It was supposed to be released on the 3rd April. BJP delayed it citing a logistical problem of bringing all their main leaders together as they are all busy filing nominations. Since then opposition parties, their supporters and media have been outraging on this delay. This is the first time in the history of Indian Democracy a manifesto has been sought with such intense passions. 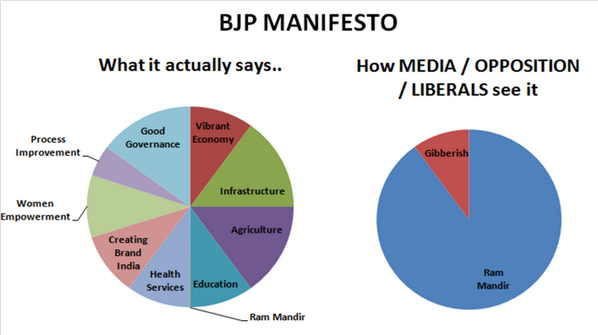 And for the first time in Indian electoral politics a manifesto has been read, analysed and debated with same emotions by BJP, political parties and media. This is how its analysed in panel discussions of newsrooms. Congress has gone to the extent of saying that BJP copied its manifesto. Abhishek Manu Singhvi has blamed Modi for stealing Sonia Gandhi’s ideas. Sure BJP did copy. But which idea, Singhvi doesn’t tell us. Yes, its true that nobody takes these manifestos seriously. Last time people took a manifesto seriously was when AAP government in state assembly of Delhi, led by Arvind Kejriwal made some unachievable 18 promises. When he failed to fulfil them, it seemed manifestos lost their credibility forever. But then Modi has been selling a dream. A dream any sane Indian would buy. A dream that has shaken the muslim-vote-pattern paradox to an extent. A dream that’s soon going to marginalise undisputed rulers of India – Congress. A dream that’s made all world powers and economists sit up and take notice. People are taking note of it because they know that these promises are made by a man called Modi. Such is the faith of his fans and supporters in his competence and intention. Mostly youth. No wonder there pledge of some 20 odd things the following is what made me read the entire manifesto. And I like that. Its kind of cool that young India understands. Enough of hypocrisy. I don’t know how far BJP will succeed in delivering this in 5 years but I have picked up some salient features which I believe Modi will most certainly implement. He may be Hitler. He may be a fascist. He maybe a mass murderer. He may be authoritative but he is passionate about the following and I know that a passionate leader can make anything happen. (Remember AB Vajpayee’s successful quadrangle highway project). Here is my pick of 15 objectives that BJP promises to accomplish and if they do will change our lives forever. Formation of a task force ‘Team India’ including Prime Minister along with his cabinet and all Chief Ministers. This will strengthen federal structure, reduce regional disparity and integrated objectivity. People-centric, Policy driven, Time bound delivery. E-Governance: Easy, Efficient and Effective. Mandate digitization of all government work to reduce corruption and delays. Deployment of IT to protect India’s priceless cultural and artistic heritage, which includes digitization of all archives and museology. Set up High-speed digital highways to unite the nation. Make every household digitally literate with a goal to make India the Global Knowledge hub, with IT being a major driver and engine of growth. Simplify legal procedure and language. Double the number of courts and judges in the sub-orinate judiciary. It also wants to extend fast-track courts to all layers of the judiciary. Insulate intelligence agencies from political intervention and interference. Completely revamp the intelligence gathering system by modernizing the intelligence department. Set up four dedicated defence universities to meet the shortage of manpower. 5. Hold Assembly and Lok Sabha elections simultaneously. Apart from reducing election expenses for both political parties and Government, this will ensure certain stability for State Governments. National Madrasa modernization programme would be initiated. Enabled with the latest in technology and infrastructure – walk to work etc, and focused on specialized domains. Wi-Fi facilities will be made available in public places and commercial centres. Government withdraws from those services which could be done by others and devote that extra time, money and energy for social sectors. Focus on Zero defect products. Medical (Ayurveda and Modern Medicine). Set up Gas Grids to make gas available to households and industry. Set up a National Optical-Fibre Network up to the village level; and Wi-Fi zones in public areas. Diamond Quadrilateral project – of High Speed Train network (bullet train). by creating a comprehensive National System of Innovation. build world class, regional centres of excellence of scientific research in the field of nanotechnology, material sciences, thorium technology and brain research. an Intellectual Property Rights Regime which maximizes the incentive for generation and protection of intellectual property for all type of inventors. Create a ‘Himalayan Sustainability Fund’. Create a Central University dedicated to the Himalayan Technology. This is my list. I am sure you have picked your favourites too.